Just like I promised, I bring to your attention the mascara that became my personal number 1 choice. I was using the regular DiorShow for a very long time, until once at the shooting of a movie episode the makeup artist used the mascara that made me go “wow!! !” when I glanced in the mirror. This is when our love story began. I’ve tracked the make-up lady down to find out what she had used. Well, you guessed it. It was Yves Saint Laurent Mascara for a False Lash Effect (Faux Cils). I’m hooked ever since. The YSL mascara makes your eyelashes look perfect - long, curly, black eyelashes with lots of volume. It smells nothing like what mascaras normally do, but it has a vague scent to it that you will be able to feel when you wear it. I love that smell. Faux Cils mascara comes in a copper and gold tube that looks luxurious and feels substantial. Its brush is straight with a tapered end to catch the corner eyelashes. Its bristles are quite densely packed which helps to minimize clumping yet coat each lash. Quick tip! After 3-4 weeks of use the brush might get clumpy. You will bring it back to life if you put 2-3 drops of water on it. Or if you are more organized than me, clean the brush with a tissue every 2 weeks. 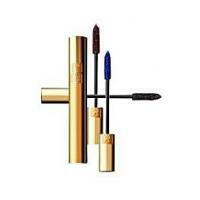 You can get Yves Saint Laurent Mascara Volume Effet Faux Cils online. Check out different colors and special deals. “I have been using this product for over a year now. The claims are true: no other mascara can give stronger, longer and thicker eyelashes than this.